Miniature self portrait (set in a double-sided locket with E.488-2010, a miniature of the artist's husband). 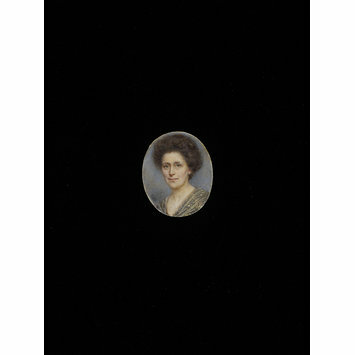 Miniature portrait by Rosalie Emslie, self portrait (set in a double-sided locket with E.488-2010, a miniature of the artist's husband). Signed lower left 'RME'. Miniature portrait by Rosalie Emslie, self portrait (set in a double-sided locket with E.488-2010, a miniature of the artist's husband), painted in England, about 1905-1910.